Early tray of Julia Marlowe who was an English-born American actress known for her interpretations of William Shakespeare. Marlowe obtained the nickname of "Fanny" and in her early teens began her career in the chorus of a juvenile opera company. She made her Broadway debut in 1895 and went on to appear in more than seventy Broadway productions. This tray commemorates some of those roles such as Juliet, Viola, Mary Tudor and Rosalind. Tray is old with crackling of the paint graphic. There are scratches, stains, rust and chipping on the edges. 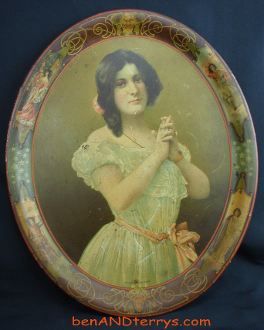 Tray shows picture of Julia Marlowe. around the inner edge of tray are characters she had played. Tray does show wear but typical of a tray of about 100 years old. See pictures for condition. Tray measures 13 1/2" x 16 1/2" x 7/8". This tray displays nicely.